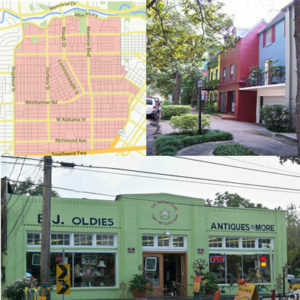 Houston is best thought of as a collection of distinct pockets of culture, and Montrose is one of the best examples of this. A lot of planning and thought has been behind the development and stewardship of Montrose, a surprising fact given its compact size. At only four square miles in size, it is a small portion of Houston, but it’s one of the most interesting and most frequented parts of the city. The community stretches from just beyond Washington Avenue to the north and runs down to I-69 to the south. It borders Midtown on its east side and River Oaks to the west. It is adjacent to the west side of downtown and is close to just about everything in Houston that deserves a visit. As such, it’s no surprise that Montrose is a major hotspot for incoming residents, and particularly young professionals that want to soak in the culture and faster-paced living that comes with the city. For decades, Montrose has been a bit of a counterculture nexus, and was a significant gathering spot for artists and bohemians during the 60s and 70s. Although it has been developed up some, the artistic and bohemian spirit remains, so people in Montrose should expect an eclectic bunch of neighbors, of all ages and backgrounds. This is all part of the Montrose experience, and the people who live in this area are energetic, idealistic and open-minded. If a spirited discussion over coffee is your thing, Montrose is your place. Unsurprisingly, the community’s artistic side is well represented at the community level. There are numerous theatres and galleries interspersed throughout the area, including one of the city’s most prized artistic spots, the Menil Collection. The Menil is a free art museum that makes up for its modest size with pieces of heavy importance. The exhibits are turned around frequently, and range from ancient to contemporary, so there’s something for everyone. Close to the Menil is the Byzantine Fresco Chapel and the Rothko Chapel, which is probably the quietest place in all of Houston. If more art, and a little science, is what you crave, though, the Museum District is just south of Montrose, and only a few minutes away. The Houston Museum of Fine Arts and Houston Museum of Natural Science are the preeminent art and science venues in the entire Houston area, and each requires several visits to enjoy everything. The Children’s Museum, perfect for families, and the Health Museum are also located in the Museum District, so there’s plenty to do. Montrose is close to Houston’s two major parks. Memorial Park is the largest urban greenspace in the U.S., outside of New York City’s Central Park. Its paths are used daily by thousands of runners, joggers and walkers, and is a great place to get some cardio in. Hermann Park isn’t as large, but it’s arguably more functional, as it is designed for families and casual park goers. Hermann Park contains the Houston Zoo, several playgrounds and numerous walking paths for people looking for an enjoyable stroll. If your preferred activity is the indoor kind, then there is a nearly limitless number of clubs, bars, restaurants and cafes to consider. There is something for every taste, and for those who love just getting out and experiencing some cuisine, it would impossible to take it all in without dedicating a lot of time to the task. In other words, this is a dense spot with plenty of options for foodies and nightlife types, so whether looking for a relaxing evening in a quiet café, or a rowdy sports bar to cheer on the Astros, Rockets or Texans, choices abound. Given Montrose’s bohemian focus, it’s natural to expect some offbeat shops and boutiques. Montrose delivers, with some of the most walkable areas in the whole city. Aside from the clothing stores and niche fashion boutiques, Montrose is, perhaps, home to the greatest collection of thrift and antique shops, with plenty of treasures lying in wait. Montrose is right in the thick of things, sandwiched between Downtown, Midtown and River Oaks. It is, therefore, a place for faster-paced people. It’s rarely completely quiet in Montrose and there is always something going on, so even in the din of night, there will be people walking around. If this sounds like your speed, then Montrose is a clear fit. The only challenge may be actually moving to the neighborhood. Montrose is dense and it’s easy to get lost when new to the area. Before long, it will all make sense, but there are plenty of dead ends and winding roads, so it’s best to have a moving expert on hand to make the transition an easy one. Houston has long been one of the primary destinations in the U.S., and Montrose is one of the primary destinations for people inside the city. In short, professional movers like JT Melia have an impressive amount of experience in moving people to the community, and this experience will be valuable when first getting settled in. Montrose has a lot to offer, and a professional mover will ensure everything arrives on time, intact, and nicely arranged so new residents can get started on the fun stuff – exploring their new surroundings.